Interactive prototypes created in Pidoco are a great resource for running quick and inexpensive user tests directly online. User tests are a very useful way to assess the usability of a proposed software UI, be it a new web shop or an enterprise application. In this post we give you some hands-on advice on how to set up a remote usability test for your Pidoco prototypes using some well-known conferencing solutions. Record the test session using a suitable conferencing tool and a computer or traditional phone. Once the test session is started, hand over moderator rights to the test user so you can see and record his screen and voice. Of course you need a suitable prototype to run a user test. When preparing for a usability test session, make sure your prototype contains all the things you want to test, in particular make sure you have properly linked all relevant navigation options in the test scenario. Also ensure that your prototype does not contain unnecessary or even misleading “ballast” like visible comments intended only for developers. 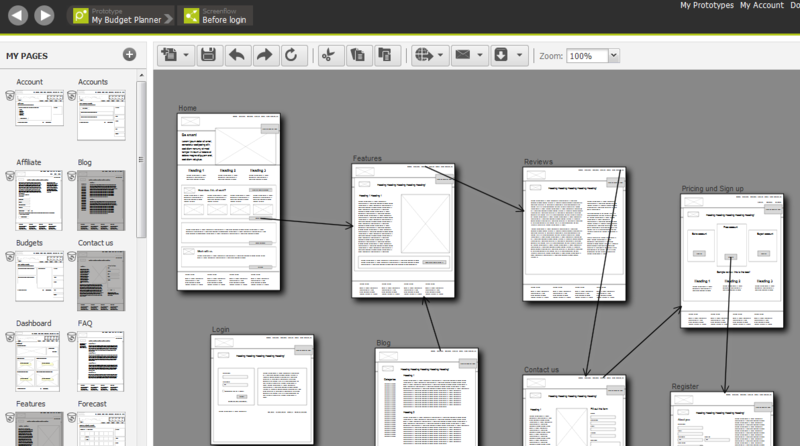 If you are testing several scenarios, you may want to use screenflows or folders to structure your scenarios. Hint: If you have invited others to co-edit the prototype with you, it is recommended to make a copy without co-editors of the prototype for testing purposes in order to prevent others from modifying the prototype while you are testing it. An easy way to grant participants access to your prototype is via a static link to the start page of the test scenario. You can find the link in the sharing dialog. If you are testing multiple task scenarios with different start pages in one test session, you may want to supply several different links to the individual start pages. Hint: Please note that static links cannot be deleted after the test session, so unless you delete the copy of the prototype you made for the test, your test users will have continued access to it via the static link. 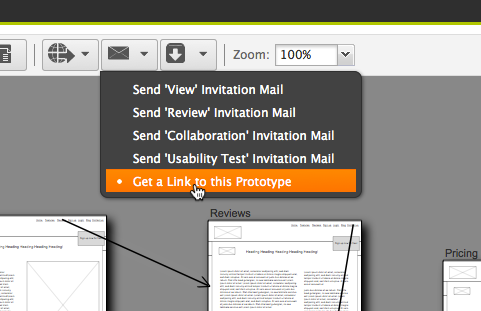 If you want to avoid this, you can send them a “View” invitation to the start page of your prototype instead. Make sure you are well-prepared for the test session, including a good test scenario, clear instructions for the test participants as well as materials and perhaps even an assistant for note taking. A written test session guide may be useful to remember all instructions you want to give your test users. Before starting the test session, make sure your voice connection is set up, i.e. your microphone and speakers (or headset) are connected and functional or you have a working telephone line in reach. Start a meeting in your conferencing solution and wait for your test participant to join. At the start of the test session, inform your test user that you would like to record the session and ask for his express permission. Now start the recording and make sure both the screen as well as the voices are being recorded. Here is an example of join.me. Instruct the test participant on the test session and his tasks. Then share the link to the prototype with him and hand over moderator rights to him so he can share his screen with you. You will now see the test participants’ screen showing the prototype to which you invited him. Run the test session as you usually would. Some conferencing solutions have a limit on the maximum duration of a session, so check yours to make sure your test session is not terminated prematurely. 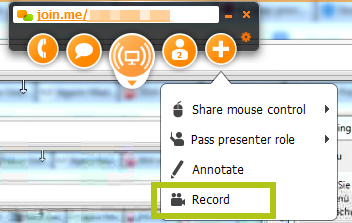 With some conferencing solutions like joine.me, you will be able to add notes to the video. Once the test session is finished, your recording will be available for download or viewing in the web browser. You can analyze the session recordings by reviewing them and taking note of interesting observations such as errors made by test participants, questions asked or feedback given. If you would like to edit out the parts that are irrelevant for later use, you can employ video editing tools on the downloaded videos as long as the format is compatible. WebEx allows for conversion of recordings to WMV, MP4, or Flash format, while join.me allows downloads in WEBM format. An alternative is to use solutions such as http://www.screencast-o-matic.com to record your test sessions instead of the recording feature provided by your web conferencing solution. Such specialized recording solutions offer easy-to-use video editing features that help you trim your session recording to the right length and focus on relevant issues or add annotations and more to them for documentation purposes. My Screen Recorder Pro will work better for you. It is an excellent screencasting tool. Records your screen and audio from the speakers or your voice from the microphone – or both simultaneously. The recordings are clear and look great when played back on your PC or uploaded to YouTube. It will record directly to AVI, WMV, MP4, or FLV. Just perfect for creating tutorials, demos, and presentations. Plus, java is not required and there are no limits on recording length. Also, the recordings play back on any device.